Posted on June 23, 2017 by Matthew Leib. This entry was posted in Spotlight, Staff Stories and tagged Spotlight, staff story. Bookmark the permalink. When Zhuou Li emigrated from China to Seattle in 1992, everything was new—everything, that is, except for the journey itself. It was a passage Li’s father had made twelve years before him and one his grandfather had completed some four decades before that. All told, Li represented the fifth generation of men in his family to leave the city of Guangzhou in southern China to find work in the United States, dating back to the construction of the Transcontinental Railroad in the 1860s. It was a family tradition that pulled at the fabric of family itself; an American story that flew directly in the face of an America that, for decades, enacted legislation to ensure Chinese workers could not establish permanent lives in the United States. If Li was following in the footsteps of his fathers before him, he would be the first to set a new path before the generations of his family to follow. Doing so wouldn’t be easy. 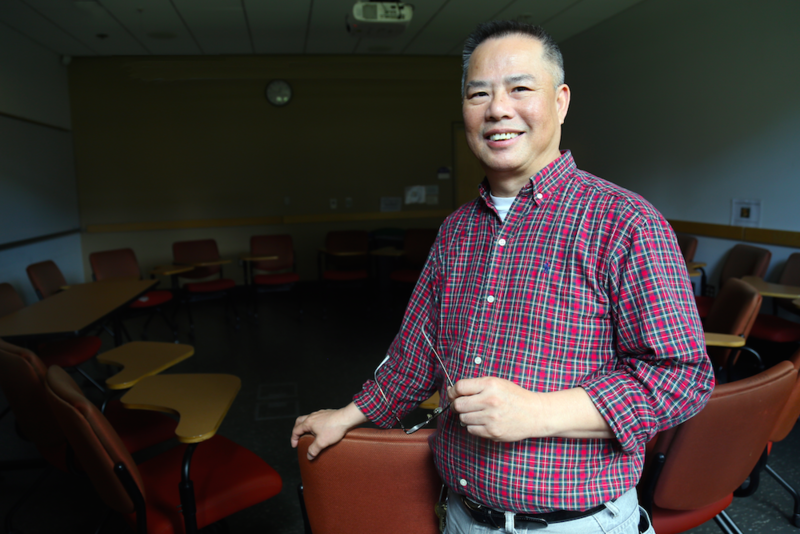 To make it possible, Li would buck another cultural norm: working as a custodian at the University of Washington. It was major change from running his own auto parts company in China, which, over the course of a decade in the 1980s, enabled him to save enough money to immigrate to Seattle with his wife. When he finally did in 1992, it meant starting all over again. He was 35, couldn’t speak any English, and, within a year of arriving, he and his wife had their first child to provide for. Not keen on following his grandfather’s path of opening a restaurant or his father’s of being an accountant, Li found a degree of stability working hourly as a custodian at the University of Washington in addition to another full-time job at the Four Seasons Hotel. Between both jobs—at the UW from 5 a.m. to 1:30 p.m and the hotel from 2 p.m. to 10:30 p.m.—he’d often work 16-hour days, leaving home at four in the morning only to return after 11 at night. He became a full-time employee at the UW in 2001, but continued working afternoons and evenings at the hotel. In addition to the long hours away from his family, there were other challenges and adjustments to be made along the way. Seattle’s wet weather, for one, was a departure from the mild, sunny winters he’d grown accustomed to in Guangzhou. Working long hours through all sorts of weather, he eventually was able to buy a house for his family in Beacon Hill, where he enjoys playing basketball with his son on Sundays as well as assisting the basketball team at the local community center. One thing he says he wishes more people realized about the University’s custodians is that it’s okay to communicate with them. He says a simple “hello” can go a long way. Today, Li works as part of the UW Building Services team at Savery Hall, but says one of his most memorable experiences at the UW was working in Paccar Hall when his daughter was at the UW studying business as an undergraduate. “She and her friends, [even though some were not Chinese], they’d see me and say, ‘Hi, Uncle!’” he says, explaining that, in Chinese culture, “uncle” can be a catchall term for one’s elders. When his daughter graduated in 2015, it marked a watershed moment in his family’s 150-year association with the United States. Li says she’ll occasionally return to campus and visit her father and brother, who is currently a rising junior at the UW, but when she does, her visits are often as professional as they are personal. “Sometimes she’ll come back to hire students,” he says. As his children set out on their own careers, Li is slowly winding his own to a close, one job at a time. He left his second job at the Four Seasons (now the Fairmont Olympic Hotel) three years ago when his father, now retired and living nearby, experienced a stroke. After work at the UW each day, Li goes to visit and care for him. As for any future plans to visit China again, Li says that besides still having many friends in Guangzhou, he has few other reasons to go back. The country has changed much over the past 25 years. Besides, for the first time in five generations, his whole family now lives in the United States. This is a lovely story!!!! Family values, strong work ethic and inspiring.